If you have been following the international news, you have likely heard about the recent crash at Lukla Airport in Nepal that occurred on August 24. Thousands of trekkers and mountaineers fly into the Tenzing-Hillary Airport in Lukla every year to begin their journey through the Everest region. To hear of a crash at Lukla is not surprising to many anxious flyers who are wary about what the History Channel has listed at the top of its “Most Extreme Airports” list. 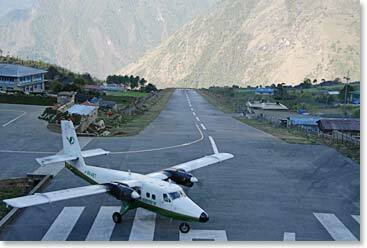 However, historically, incidents at the Lukla airport are rare. Very few planes attempt travel there during the monsoon season. Because of this, there have only been six previous incidents in the entire history of the airport, and only two of those involved fatalities. Also, to clarify a little, the fateful flight on August 24th did not crash at the Lukla Airport. Due to heavy rains, the pilots had decided to turn around and head back to Kathmandu, rather than attempt a landing at Lukla. It was outside a small town about 50 miles from Kathmandu that the plane unfortunately went down. All of us at Berg Adventures would like to send our thoughts out to the families and friends of the passengers and crew at this sad time.